2. The Sun is recognized as having the largest mass in our Solar System. 5. Earth orbits the Sun 365 days, yes, one year. 6. The Sun rotates every 25-36 earth days. 7. The Sun’s energy travels outwards. 9. The Sun is made up of 92% hydrogen, 7% helium and the remainder of various gasses. 10. The atmosphere of the Sun is composed of three areas: the photosphere, chromosphere, and solar corona. 11. Corona is the Sun’s outer atmosphere with temperatures that range from a few thousand kelvins to a few million kelvins. 12. Helmet streamers are big white regions that extend out from the Sun in which solar plasma are trapped by the magnetic field of the Sun. 13. Solar flares from the Sun are sudden bursts of brightness that happen in places near the sunspots. 14. Sunspots appear on the surface of the Sun and look dark because of the lower temperatures near it. 15. The internal structure of the Sun is composed of: the inner core, radiative, core, and the radiative core. 16. 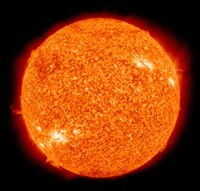 The inner core is the hottest part of the Sun, and can reach 27 billion°F. 17. A solar eclipse occurs when Earth passes the shadow of the Moon. 18. A total solar eclipse occurs only during a new moon, which is when the moon sits directly between the Earth and the Sun. 19. Radiations of the Sun are in two forms, electromagnetic (photons) and particle (electrons, protons, alpha particles, etc.) radiation. 20. In February 1974, Skylab was the first manned spacecraft to study the Sun. 21. Solar flares occur when magnetic fields of the Sun come together and cause huge explosions on the Sun’s surface. 22. Solar flares produce bursts of electromagnetic radiation, x-rays, ultraviolet radiation, visible light, and radio waves. 23. Johann Rudolf Wolf, in 1848 developed a method to count sunspots which has been called Wolf number. 24. Most ancient civilizations have based their culture on the presence of the Sun. These include the myths as developed by the following people: Egyptians (Re or Ra), Aztecs (Tonatiuh and Huitzilopochtli), Greek (Helios), Inca (Inti), and the list goes on. I think that this website is very help full and has amazing facts , maybe these facts may not appeal to some people because 1.They may know most of the facts or 2. These facts are maybe what they’re not looking for exactly , anyway whatever the matter is everyone has a right to state a opinion but if it negative its best to either keep it to your self or otherwise turn a negative comment into a feedback comment ! The Sun is the star at the center of the Solar System. It consists of hot lava and a strong magnetic fields. The energy from it comes from many hydrogen nuclear fusion reactions at its core. The Sun holds about 99.86% of the mass in our Solar System, with the most of the rest belonging to Jupiter. The Sun consists of about 70% hydrogen, 28% helium, and 2% of the remaining consists of carbon, oxygen, iron, neon, and other elements.